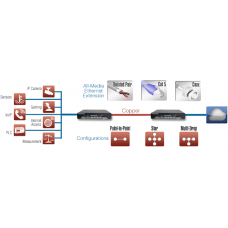 Ethernet extenders allow network designers to extend Ethernet connections well beyond the standard 328-foot (100-meter) Ethernet distance limitations. Ethernet extenders can establish long-range, high-speed data communication links between geographically separated LANs or LAN devices. Ethernet extenders are often employed to connect workgroups on different floors within a building. Ethernet extenders can eliminate the need for expensive Ethernet switches and Cat 5 cable by using fiber-optic or copper twisted-pair cables to transparently send packets at full line rates to a peered LAN up to 5 miles (8 km) away. IT managers typically deploy Ethernet extenders within a limited geographical area. Yet this area need not be limited to one building. Ethernet extenders can create reliable bridged-Ethernet connections across streets or over a college or enterprise campus and between Ethernet LANs up to 5 miles (8 km) apart. Ethernet extenders are cost-effective alternatives to more complicated and pricey wiring choices like Cat 5 cable. Because Ethernet extenders are plug-and-play networking devices, they are fast and easy to install. 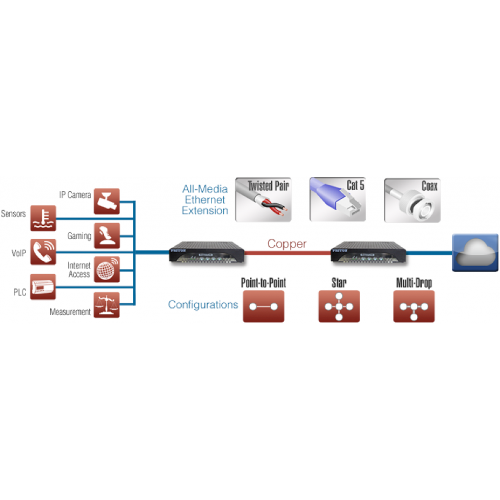 Taking advantage of existing copper twisted-pair network infrastructure, and depending on the required data rate, Ethernet extenders may increase the distance of an Ethernet link up to 5 miles (8 km) and beyond.